Join Cindy and Jay as they cruise with the Great Lakes Sailing School’s flotilla of yachts to various ports of Grand Traverse and Little Traverse Bay. Stay aboard as a boat and breakfast guest Friday June 24th and depart on Saturday morning returning Friday July 1st in time for Cherry Festival in Traverse City. Join us for the entire week or just 3 days at Charlevoix, Northport, or Old Mission Peninsula with privately arranged wine tours or in conjunction with a stay at the Grey Hare Inn Vineyard B & B. Cost starts at $500 per day for boat and breakfast, and up to $1200 for captained cruising for up to 4 people with gourmet food and beverage provided. Enjoy an all-inclusive charter traveling between ports with the owners as they follow these beautiful schooners and barques between the ports of the Tallship Challenge held every 3 years. Maritime Heritage Alliance’s Madeline will be going to the events listed below and the plan is to follow her along the coasts of Lake Michigan and Huron enjoying points in between to suit the charterer’s desires for location. Cost $1000 per day for 2 person, $1300 for 4 with a minimum of 3 nights. Or use the Balia as your boat and breakfast hotel accommodations at a nearby marina while attending the Tallship Festival in the selected port. Cost $600 per day for 2 persons, $800 for 4, and $1000 for 6. Walk to all of the film venues from your location aboard the Balia at Traverse City’s Clinch Marina, and have a front row seat for the nightly movies at the Open Space. This well-appointed 3 cabin/2 head sailboat includes fitted sheets and towels providing for a luxurious and unique place to stay during this acclaimed film festival. We’ll even get you tickets to the Sponsors party to rub elbows with the celebrities! Enjoy your evening cocktails on the screened canvas enclosed cockpit deck providing shade from the summer’s sun and relief from any unwanted flying pests. Cost is $1000 per day for up to 4 people, $1300 for 6 with breakfast provisions required and a 4 night minimum booking. Extend your experience with either a day sail on Grand Traverse Bay for $125 per person including food and beverage; or sail to other ports with the owners as your Captain and crew. Or come to the Grey Hare Inn for breakfast as an alternative to eating on the boat in the morning. After attending the Bay City Tallship Festival we can also leave in time to watch a portion of this race as more than 82 boats sail north. A side trip to the National Underwater Marine Sanctuary can also be added to your itinerary. Or extend your stay on Mackinac Island using our boat and breakfast option and wait for the ships to come in from Chicago the next week, or even cruise the North Channel in between the two races. Similar pricing to other events itineraries but customized to fit your needs. Either meet up with this large fleet of boats off the coast of Leland as they pass through the Manitou Passage on their way to Mackinaw. 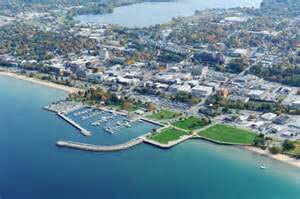 We would anchor off South Manitou the night of July 24th then follow the boats north to Beaver Island. 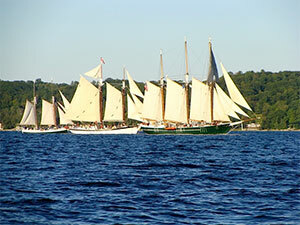 Or sail with the owners as they take the Balia from Traverse City to the Chicago Tallship Festival that starts on July 26th and sail through the large fleet going the other way. 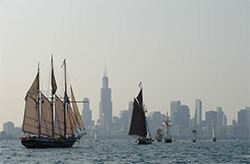 Or book the Chicago Tallship package and we will get the boat there early enough to watch the start of this magnificent race from the waters off Chicago. Similar pricing to other itineraries.